Every fire season, Western Shelters can be seen dotting the landscape around the western states. 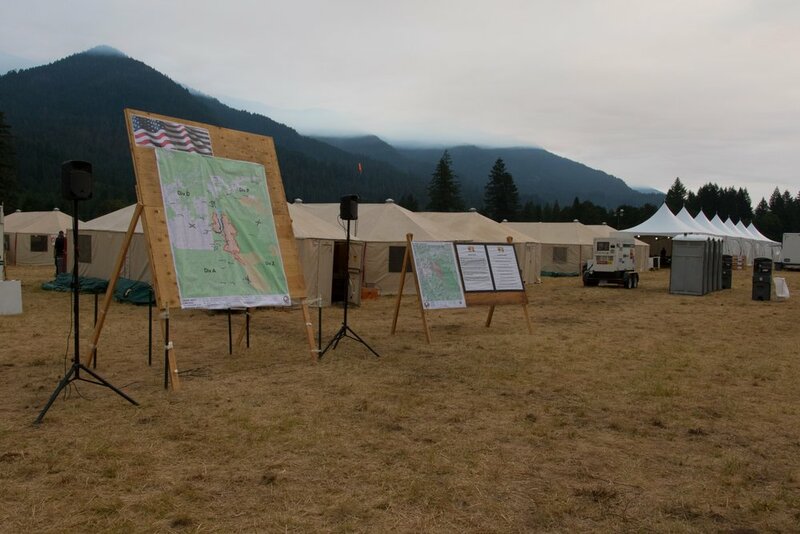 We got our start as a business providing our shelters to fire camps in the Pacific Northwest, and this week we had the opportunity to visit one of those camps. The Terwilliger Fire is burning about an hour's drive up Highway 126 from our Eugene factory. The ICP is set up at the Tokatee Golf Club, close to the fire. When we arrived at the camp Thursday morning, the Northern Rockies Type 2 Team had just taken over command of the fire from the Southwest Type 2 Team. Their first day managing the fire was underway. Camp was busy but quiet, after a night where fire activity fortunately slowed a bit. The Craig Hotshots were returning from the fireline, and lining up for breakfast. The fire currently sits at 7,572 acres and 17% containment. Western Shelters were placed throughout the camp, including a main thoroughfare with twelve GateKeeper 1935s, each with a different designation, including medical, communications, finance, and more. Two additional 1935s were placed at different locations, one used for supply and one used for inspection. GateKeeper 1935 with Divider Wall. GateKeeper 1935 as a treatment center. We're very thankful to the U.S. Forest Service and the Northern Rockies Incident Management Team 4 for welcoming us into the camp. User feedback is very important to us, and visiting and talking to our customers to see how we can make our products even better is always an opportunity we try to take advantage of.